GameGain 2.1.7.2008 is tools & editors software developed by PGWARE LLC. 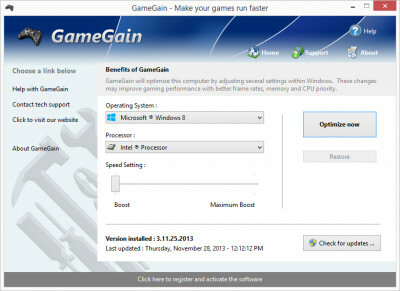 GameGain is a tool for all that allows you to modify your computers settings to increase gaming performance. No modifications to your hardware are made and all adjustments and settings are done in an easy to use interface that a child could use. 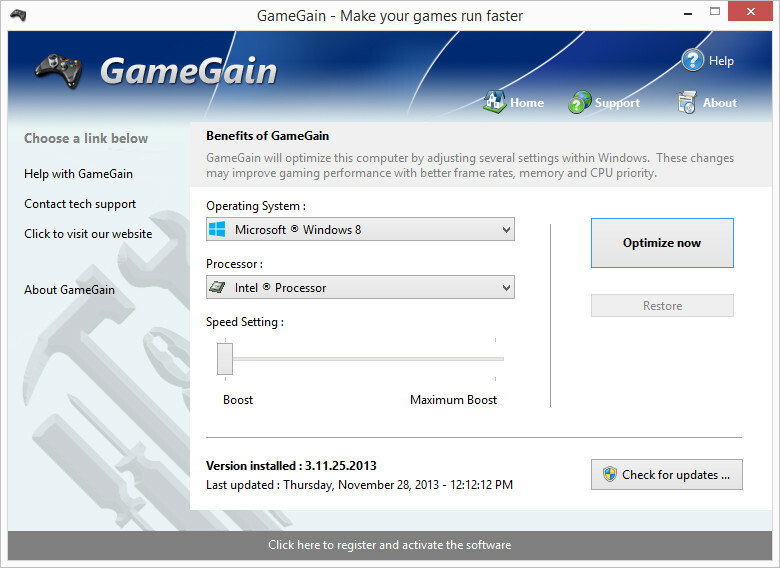 No more frame rate glitches or slow downs can be achieved by using GameGain with your favorite games. This program is shareware, which means you can download and use GameGain 2.1.7.2008 for free during 30-days trial period. After this period you gonna have to buy GameGain 2.1.7.2008 software for $11.99 or uninstall the program. GameGain 2.1.7.2008 supports English interface languages and works with Windows 98/XP/Vista. Latest GameGain 2.1.7.2008 does not contain any spyware and/or advertise modules, allowing installing it with no worries concerning valuable information loss. Our website has thoroughly tested games & entertainment product GameGain 2.1.7.2008, written the review and uploaded installation file (841K) to our fast server. Downloading GameGain 2.1.7.2008 will take several seconds if you use fast ADSL connection. PCXL helps you optimize your computer to increase system performance.